병와 이형상(1653∼1733)은 효령대군의 10대손으로 숙종 6년(1680) 별시문과에 급제하여 호조좌랑 등을 역임하고 덕유산에 도적이 많아지자 문무를 겸비한 인물로 추천되어 금산군수로 부임, 도적을 평정하고 선정을 베풀었다. 영조 3년(1727) 호조참의에 임명되었으나 사퇴하고 영천에 홍연정을 세워 학문에 열중하였다. 이듬해 가선대부가 되고 후에 한성부윤에 이르렀다. 병와 이형상 유품에는 인장 23점, 호패 9점, 거문고 1점, 화살 9점, 갓끈 5점, 관자 4점, 홀 1점, 옥피리 1점, 칼 2점, 표주박 2점, 벼루 1점, 추구통 1점 등이 있다. 인장 중에는 그의 이름과 호로 된 것들이 있고, 후손의 인장도 상당수 있다. 호패는 그가 문과에 급제한 해에 발급된 것이며 후손들의 것이 다수 보관되어 있다. 거문고는 그가 제주목사로 있을 때 이름을 알 수 없는 노인이 한라산 백록담에서 저절로 말라죽은 박달나무로 만든 것으로 그의 선정을 기려 선물한 것이라고 한다. 거문고에는 서문 등의 글이 새겨져 있다. 홀은 상아홀로서 그가 관복을 입을 때 손에 들었던 것이다. 옥피리는 일부 파손되어 두 토막으로 갈라져 있는데, 이것은 그가 평소에 애용하던 것으로 악학에 대한 관심과 조예가 깊었음을 보여준다. 칼은 곡도와 은장도 2종이 있다. 곡도는 장도로 길이 67.8㎝, 폭 3㎝, 자루 길이 12.3㎝가 되는 것으로 이것은 임진왜란 이후의 장도형식의 변천을 잘 보여주고 있다. 표주박은 허리에 찰 수 있게 고리를 달아 끈으로 매게 되어있고 벼루는 흑색의 옻칠함에 넣어져 있다. 이외에도 갓끈과 망건줄을 꿰는 관자 등이 있는데, 특히 그와 후손들이 쓴 것으로 보이는 갓끈과 관자의 재질은 당시의 재위를 나타내고 있기도 하다. 이 유품들은 그의 귀한 인품을 보여주고 있으며 지금은 볼 수 없는 귀한 유물로 가치가 크다. A military official, Yi Hyeong-sang (pen-name: Byeongwa, 1653~1733) was the 10th grandson of Prince Hyoryeong. He passed the state-run examination in the 6th year of King Sukjong’s reign (1680) and successively assumed various Government posts. When thieves were rampant in Deokyusan Mountain, he was recommended and appointed as Governor of Geumsan-gun, being a suitable person equipped with both literary and military skills. He suppressed all the thieves and governed wisely there. He was appointed Hojochamui in the 3rd year of King Yeongjo’s reign but retired soon. He then built Hongyeonjeong House in Yeongcheon and devoted himself to studying. The following year, he was offered the official rank of Gaseondaebu and reached the Hanseongbuyun rank later. 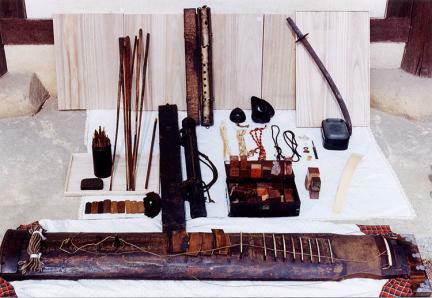 His relics include 23 pieces of registered seal, 9 hopae (identification tags), 1 geomungo (6-stringed Korean zither), 9 arrows, 5 chinstraps for Korean hats and 4 gwanja (headband buttons), 1 hol (scepter), 1 jade piri (pipe instrument), 2 knives, 2 pyojubak (gourd dipper), 1 byeoru (inkstone), and 1 chugutong (tube of bamboo needles). Most seals are engraved with his name and penname, but some seals have the names of his descendants. The hopaes were issued when he passed the state exam to become a civil official, and some belonged to his descendants. The geomungo was a gift given to him by an old man. When Yi Hyeong-sang was serving as Jeju Moksa, the old man made the instrument with Betula schmidtii wood from Baengnokdam Lake, Hallasan Mountain to honor Yi’s good governance. A prelude is inscribed on the instrument.The hol is made of ivory; he carried it when he wore an official uniform. The jade flute is partially damaged and divided into two. It shows that he enjoyed playing the instrument, and that he was very good at it. There are gokdo (curved knife) as well as two kinds of silver-decorated knife. The gokdo is an encased ornamental knife measuring 67.8cm long and 3cm wide. It shows the change of style of jangdo after the Japanese Invasion of Korea in 1592.The gourd dipper was designed to be attached on the waist. The inkstone is encased in black lacquer case. The hat chinstrap and gwanja seem to have been used by his descendants. Their qualities show his social class at that time. The relics are considered to be precious folk materials that cannot be found nowadays.